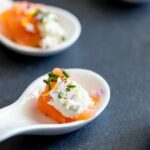 Cut the smoked salmon into 12 pieces and arrange them on your spoons or small pots. Sprinkle over the chopped red onion, chives and lemon zest. Garnish with a little cracked black pepper and serve.